In 2018, I ran 598.7 miles. This is significantly less than anticipated. I should have know that my annual mileage would be low, especially since consistency has always been a struggle, which is the primary reason I sign up for so many Half Marathons (usually one per month): At least I’ll get 13.1 miles in each month. New year running resolution if I write (type) it, I must accomplish it! This year, I am going to set a reachable goal of 750 miles and will be celebrating like a Boston Qualifier if I end up tracking 1,000 miles for the year. How about you: Do you have any mileage goals for 2019? How do you stay motivated to keep going when the blankets are so warm, the pizza is so delicious and the work day is exhausting? Do you need help staying motivated? Would registering for races help? I will run in (for the 7th time) the Gazelle Girl Half in Grand Rapids, Michigan. This event started as a celebration of Title IX, the law that made discrimination between men's and women's educational programs illegal. The event has really grown, over the years, and has raised funds for Girls on the Run of Kent and Muskegon Counties in addition to the Gazelle Sports Foundation, Grand Rapids Opportunity for Women and YWCA. Last year, I ran the Savannah Publix Women’s Half and had such a wonderful time! The route starts and ends at Forsyth Park, down tree-lined streets, around 12 of the city's scenic squares in the historic district before a picture-perfect finish at Forsyth Park Fountain. The post-race party was like something I had never experienced: Mimosas in Forsyth Park! I have already signed up for this Half. If you would like to join me, use discount code BIBSAV20 to save 20% on your registration. Use code “BRSCVIP” for 10% off! Use code “BRHCSanFran” for a free phone armband! Use code “BRHCCharlotte” for a free phone armband! Use code “BIBRAVE19” for $10 off the full & half (includes the combo options of full + 5K, half + 5K etc.) and $5 for the Tropical 5K alone. Use code “SCMBR10” for 10% off! Use code “BRHCHouston” for a free phone armband! Use code “BIBRAVE” for $3 off! Use code “BRHCDallas” for a free phone armband! Use code “DBHMRAVE19” for 10% off the half, half relay or challenges. This code is good until 1/31/2019. Use code “SHAMROCKBR10” for 10% off! 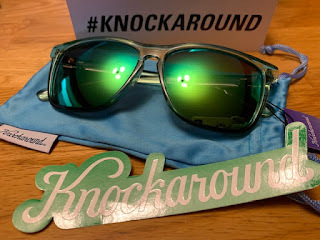 Use code “TARHEELBR10” for 10% off! Use code “UNITEBR10” for 10% off. Use code “SBBR10” for 10% off. Use code “RAVENSAVE” for 10% off (excludes kid's race). Use code “STARBR10” for 10 % off. Use code “NJSTBR10” for 10% off. Use code “N2SBR10” for 10% off. Use code “SC10BR10” for 10% off. Use code “LBMBR10” for 10% off. 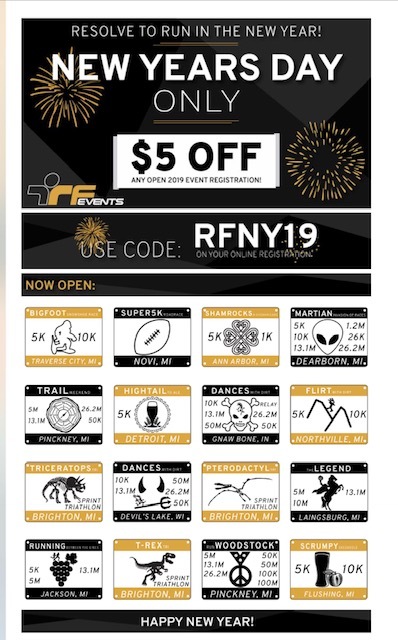 Also, if you are interested in any races in the Ann Arbor, Michigan area (Go Green), use discount code RFNY19 for $5 off on any open 2019 Event Registration. Disclaimer: I received a Zwift Foot Pod to review as part of being a BibRave Pro. Learn more about becoming a BibRave Pro (ambassador), and check out BibRave.com to review find and write race reviews. I hate running on the dreadmill, so much so that I never call that machinery the proper name. I am afraid of ice because I know that it will to fall. So when I was presented with the opportunity to test Zwift for virtual running I thought perhaps this would be an opportunity to embrace dreadmill running. And let's be honest, running is always be better with technology enhancements (AfterShokz Trez Air, MapMyRun, Garmin,etc). 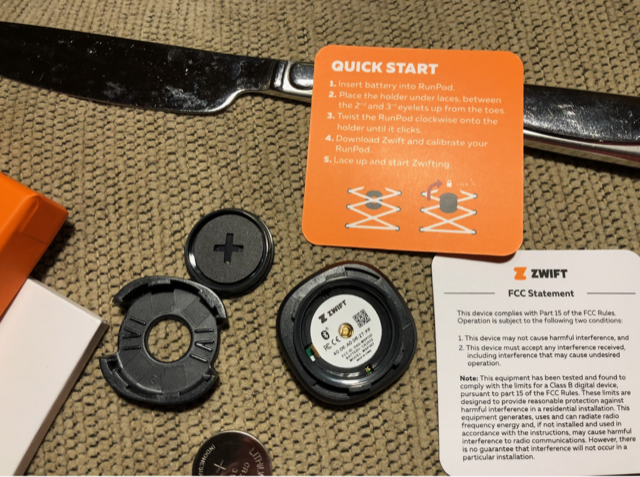 The Zwift foot pod came in the mail with instructions on how to activate. I did need a little assistance from other Bib Rave Pros as it was so small, I was worried that it would break, when I took it apart to set it up. My account was free and easy to set up. The app was easy to download onto my iPad. It seems as though there is a large bicycle following and application, which I am sure my spouse will want to try. To get the foot pod to calibrate with other technology, it is important to have the smooth side facing the top of the foot. If problems persist, one may need to take the battery out and try a reset. There are all sorts of virtual group runs scheduled. BibRavePros participated in an Orange BibRave Virtual Run on December 18th and participants passed familiar people, while bikes also passed runners. 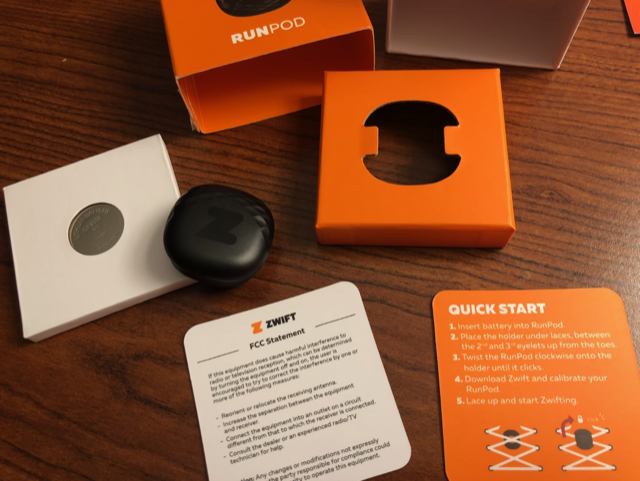 Use the discount code BibRave15 for 15% off the cost of the Zwift RunPod at Zwift.com (discount is good for first 1000 Pods to use the code).